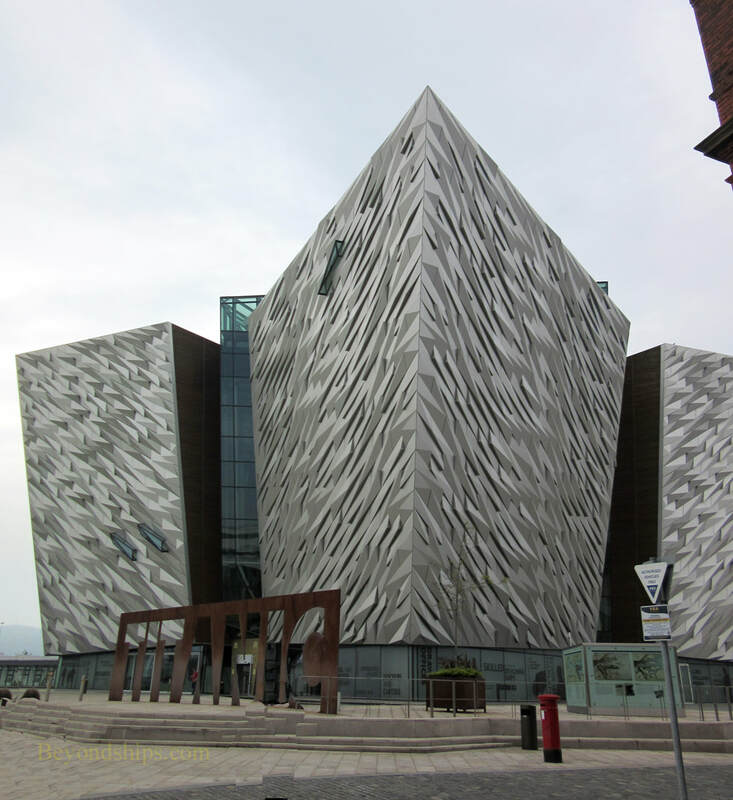 Titanic Belfast is the most popular tourist attraction in Northern Ireland. It boasts it is the largest attraction in the world dedicated to the ill-fated ocean liner Titanic. The story of Titanic Belfast is one of overcoming adversity. As this millennium dawn in Northern Ireland, Belfast was not in a good position. It had once been a leading shipbuilding center but now that business had all but vanished. Queen's Island, a mass of land reclaimed from the sea in the 19th century, had been the heart of the shipbuilding area and now it had become a vast, derelict, heavy-industry eyesore. And although the Troubles had subsided, Belfast's reputation as a place of violence and lawlessness lingered. One asset Belfast did have was its association with Titanic. The Titanic story had long been well-known but with the 1997 James Cameron film, the Titanic story had captured the world's imagination on a grand scale. 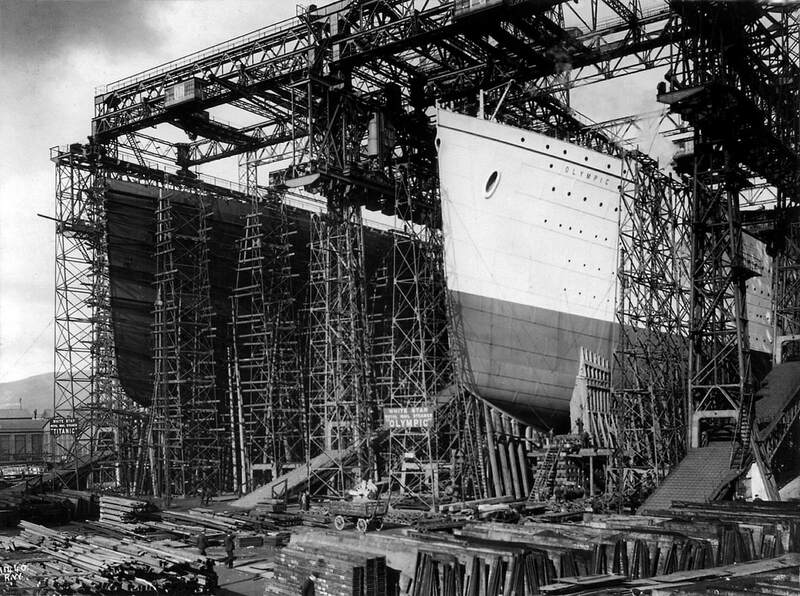 Titanic was built in Belfast. Perhaps that connection could be used to attract visitors and rebuild Belfast's fortunes. Therefore, it was decided that the redevelopment of Queens Island would center upon a Titanic museum. Perhaps this musuem would do for Belfast what the Guggenheim Bilboa had done for Bilboa. Accordingly, a public/private partnership was established under which the museum would be built largely with public funding but operated by the private sector. 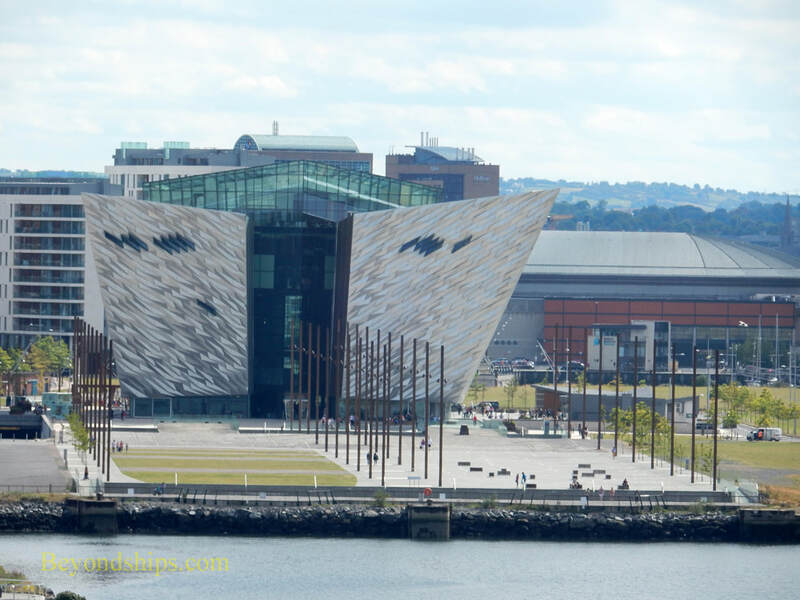 American architect Eric Kuhne designed the building, which stands at the end of the slipways where Titanic and her sister ship Olympic were built. It towers above the surrounding area, which is now mostly open space. Its distinctive angled structure is reminiscent of the ships that were built at the Harland & Wolff shipyard in the Titanic era. The building has some 130,000 square feet of exhibit space on six floors and is also the largest conference center in Belfast. It cost 77 million pounds to construct, making it one of the most expensive buildings of its kind in Europe. Creating a monumental building to house the museum was only half the battle. Indeed, perhaps even more of a challenge than creating the physical space was the question of how do you tell the story in a way that would attract visitors. Everyone knows the name Titanic but so too everyone is familiar with the general story. Furthermore, very few artifacts relating to Titanic would be available to help tell the story. The creators of the museum met this challenge through the innovative use of technology. Instead of the traditional rows of display cases, the museum's exhibits rely primarily on a wide range of audio and visual technology. Much, if not all, the information presented can be found elsewhere. However, the museum brings it together and presents it in an entertaining manner. Above: The slipways where Titanic and Olymoic were built. In the distance is the Stormont Wharf where modern cruise ships often berth. Below: The same place during the construction of the ships. Titanic is on the right. Above: The angled building recalls the bow of a ship. Titanic Belfast opened in 2012. In its first year, it attracted nearly twice the number of visitors than had been expected during the planning period. It remains very popular. Visitors follow the story through nine galleries, which present the story in chronological order. It sets the stage by describing Belfast in the years just before Titanic was built and then moves through the building of the ship at the Harland &Wolff shipyard, Titanic's launch, its fitting out, the voyage, the sinking and the aftermath (e.g. the American and British hearings). It then goes on to discuss the myths and public image of Titanic that have grown up since the disaster. The conclusion is a gallery devoted to the rediscovery of Titanic in 1985. Because it is a self-guided experience, visitors can spend their time on those galleries that interest them and just walk through those of lesser interest. There is too much information to concentrate on everything. The exhibits that I found the most moving were the audio presentations of the survivors accounts of the sinking and the photographs taken by Father Browne aboard Titanic on the short leg of the voyage that took him to Queenstown (Cobh). I was also impressed with the large screen theater at the end of the exhibits on which video of the wreck of the Titanic is displayed. The size of the image allow for more detail and you feel more in the presence of the ship. The most controversial part of the Titanic Experience is the Shipyard Ride. Visitors board small cars and swoop through a stage set of the shipyard. There is the sound of riveting, a glowing furnace, and the tall steel columns of the gantry as well as video images on the walls. It is somewhat like a Disney-style theme park. However, it does capture the imagination as well as entertain. 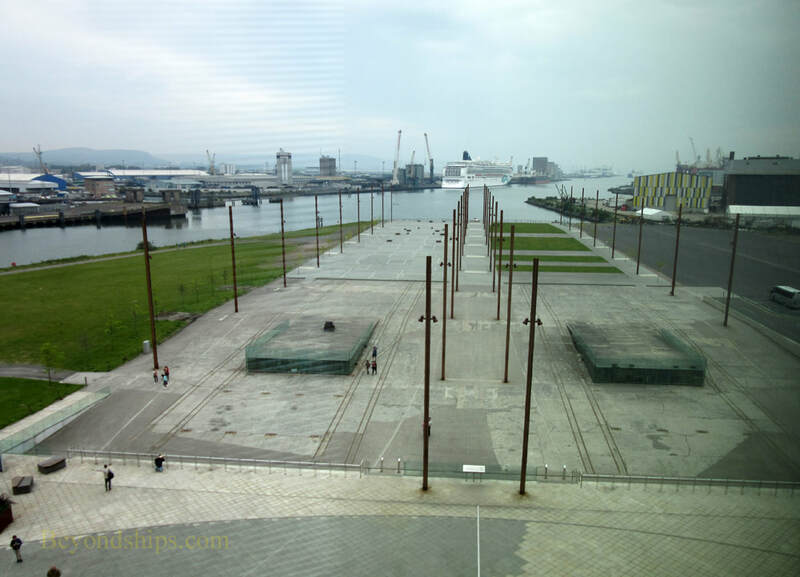 As noted above, the slipways on which Titanic and Olympic were built, lie just outside the museum building. The area does not look like it did when the construction took place. Rather, it is park-like with the slipways outlined. Titanic's slipway is paved while Olympic's is covered in grass. Despite the change in appearance, the area does convey a feeling of connection. Walking the length of the slipways, you get a feeling of the size of these ships. Although small compared to today's cruise ships, these ships were still quite big. When you think that they stood as high as the museum building that now towers over the slipways, it is even more impressive. On the opposite side of the museum building is a small graving dock containing SS Nomadic, the only surviving White Star Line ship. (See separate article). Admission to Titanic Belfast is regulated by tickets, so it does not get overcrowded but one should expect a significant number of people at this popular venue. The museum has restaurants as well as a shop. For more information about Titanic Belfast, see the Titanic Belfast website.